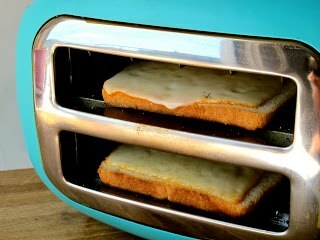 Vinnige “Toasted Cheese” Broodjie: Draai jou toaster op sy kant, sit stukkie kaas op snytjie brood en toast !! 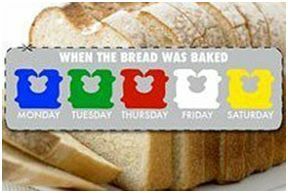 What the color of the twist tie or tabs on bread packaging means; namely, what day of the week the bread was baked on. This practice of having a different color twist ties or tabs for different days of the week is not meant necessarily to be used by the customer, but actually to aid the person stocking the shelves with bread in determining what bread is old and needs removed from the shelves. This way, they don’t actually have to look closely at the tabs (which usually also show a “sell by” date); they can simply just look for ones of a specific color and remove those. Unfortunately, there is no industry wide standard on a specific color scheme, so each bread manufacturer uses their own color code. 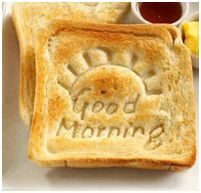 However, you can find out what the color scheme is for your favorite bread by either checking around on the web or simply emailing the company that makes your favorite bread and asking. If you happen to be at the store when someone is stocking the bread, you could always ask them as well.